The quilt is beautiful, and knowing that it was made by Jill’s mother makes it even more special. The top is 80” x 81”. 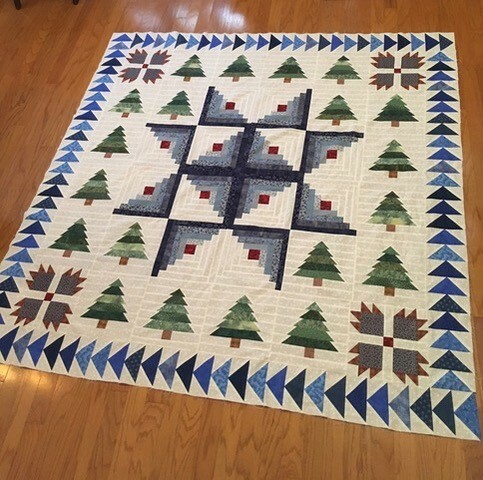 I love the center star, the log cabin blocks, the flying geese borders, the bear paws in the corners, but especially the pine trees. And the colors work together so well to make this a work of art. 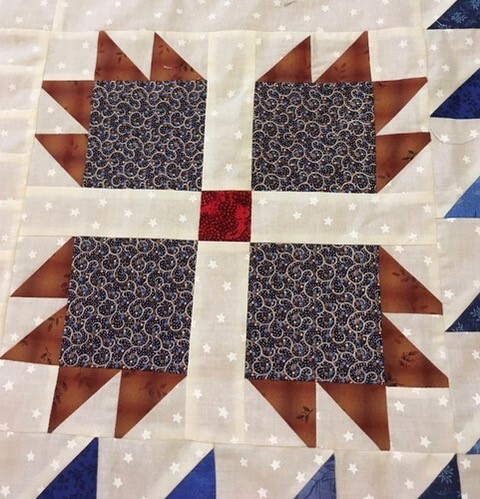 The center of the bear paws blocks has the same red fabric . . .
. . . as the center of the log cabin blocks. 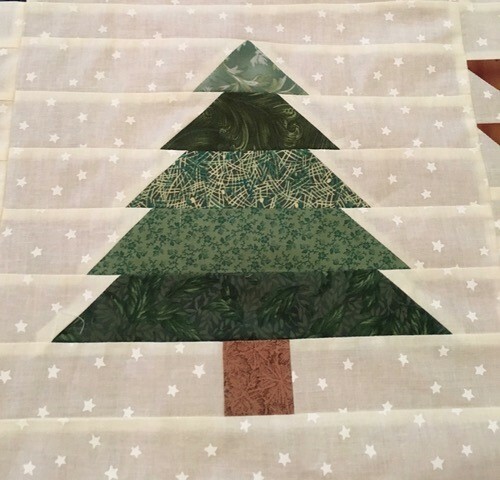 Jill’s mum used many different fabrics in the pine trees. Each tree was made in the “improv” style: the trees are of different heights, and the white logs at the top of each tree were used to make the blocks a uniform size. I love that! Can you believe Jill was willing to part with this top? I sent it to Cheryl in Dallas because I know it will be well loved and appreciated at the charity she supports. Cheryl is like me in that she thinks all quilts should be BIG. 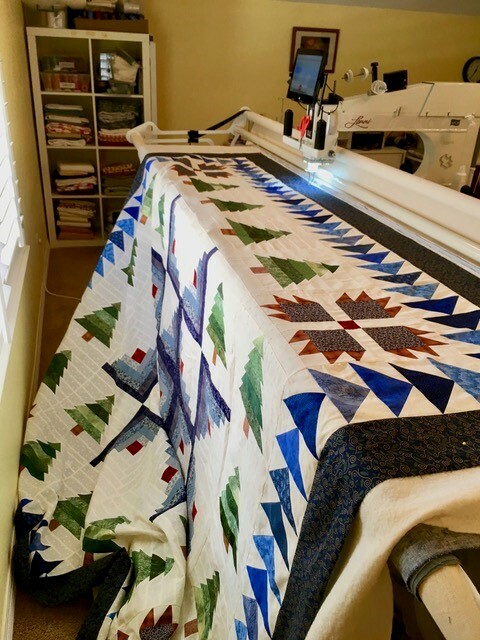 She added a navy print border to the make the quilt long enough for a twin size bed. 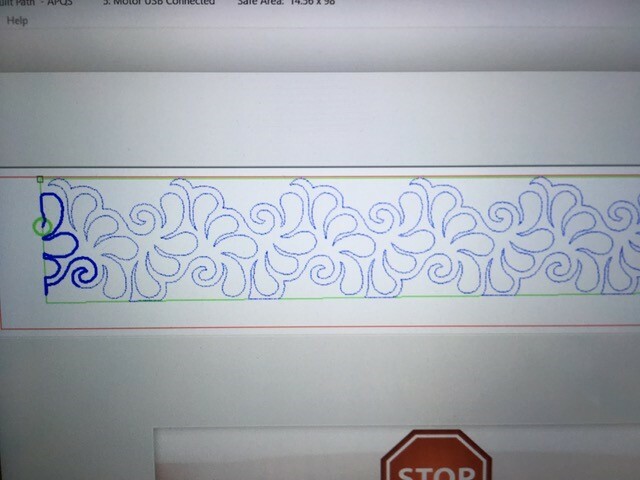 The digital quilting pattern is Zoidberg Feathers, designed by Barbara Becker. It’s a new interpretation of the traditional feathers that quilters have loved forever. It’s perfect for the quilt don’t you think?? The finished quilt is 88” x 89”. 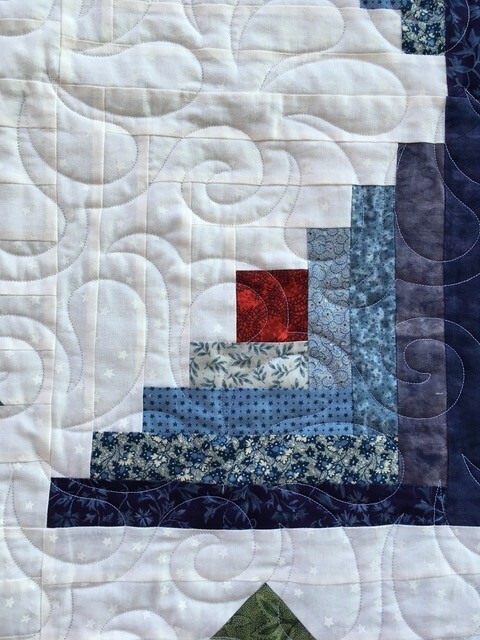 With the addition of the new border, the dark blue backing was not quite big enough, so a pale blue band was inserted to make it just the right size. 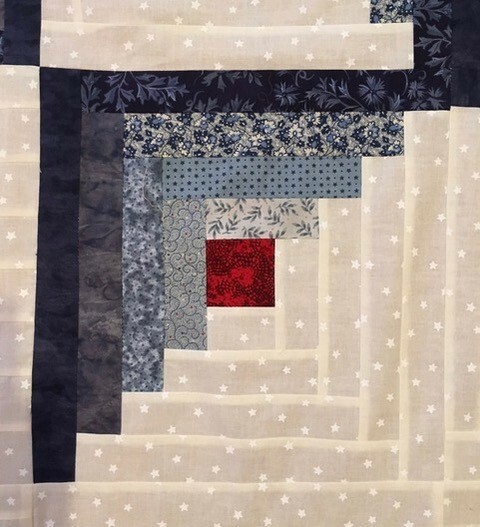 This entry was posted in Charity Quilts on March 22, 2018 by Jo. That is one beautiful quilt! Since I’m sure someone will ask….the pattern is by Eleanor burns. Think it’s called bears in the cabin. I may be wrong on the name, it’s been a long time ago that I quilted this one. Beautiful quilt! Wow, what a generous donations that many have made it happen. Its is beautiful. Thanks, Jen. I loved this quilt so much that I went right to Amazon and ordered the book. Yes, it is an Eleanor Burns book and it is Bears in the Cabin. 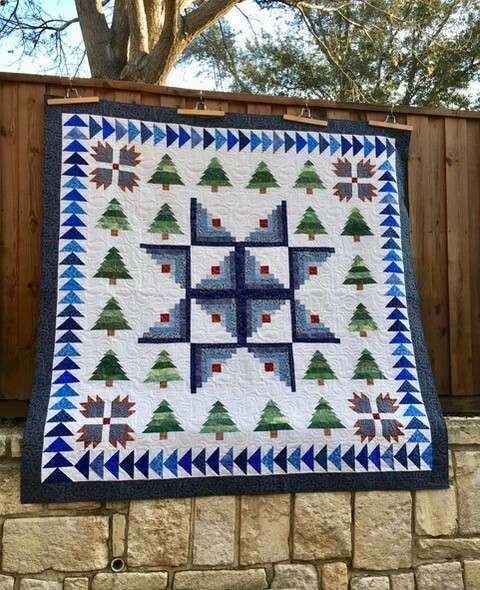 My sister made a quilt with trees in the border that was similar, but she didn’t have a pattern. She made it up herself. Thanks so much for the information. How generous to give up such a lovely quilt. It never ceases to amaze me the generosity of quilters!!! This is a gorgeous quilt and some woman will be thrilled to own it! Great job ladies! 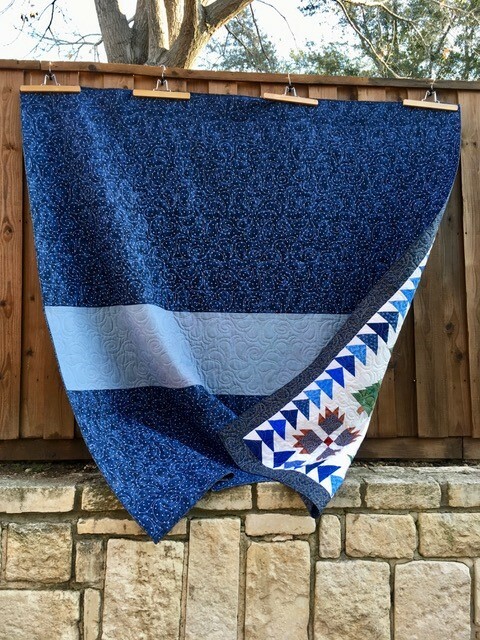 This quilt is so beautiful, my immediate thought was a charity using it for an auction to raise money. I also thought I remembered seeing this pattern and my thoughts ran to Eleanor Burns. Thanks, Jen, for confirming that. I, too, like the flying geese in the border. It is an Eleanor Burns pattern…Bears in the Woods is the name! Judy was close enough for me to find the pattern! I am so happy to see this go to a special cause. I know my mother would be very happy! Thank you Jo for making this happen and Cheryl for doing such a lovely job.